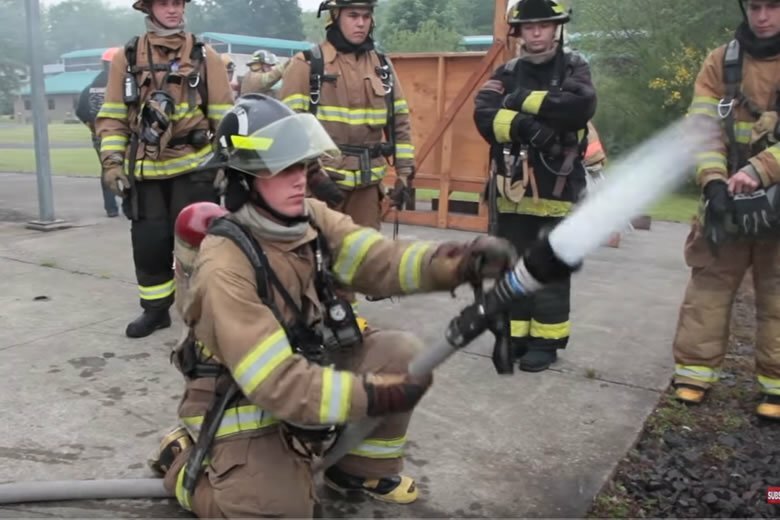 Fire Attack & Hose Advancement Techniques – Cadet FireFighter Training at MERTS Clatsop C.C. In this episode the F.L.A.R.E. Cadets are taken through hose evolution drills inside the M.E.R.T.S. facility (The Marine and Environmental Research and Training Station) at Clatsop Community College in Astoria, Or. This series is perfect for teens who are interested in becoming a firefighter in the US. These teen cadets have had several years of training and are applying what they learned in the classroom in this at M.E.R.T.S. The C2FR F.L.A.R.E. Cadet Program (FireFighter Leadership and Response Exercise) is a three day event that takes place between the Camp Rilea Armed Forces Training Center and the M.E.R.T.S. facility located in Astoria, Or. For additional information on Fire Attack & Hose Advancement Techniques please contact Kirk Meller, Cowlitz 2 Fire & Rescue Volunteer Coordinator, by email (kirk.meller@c2fr.org) or by phone at 360.575.6281.